The torc (also spelled torque) is a metal ring worn on the neck. It is not uncommon for people to refer to bracelets and arm rings as wrist and arm torcs, but generally the term ’torc’ is understood to mean a neck ring. Torcs are most commonly identified with the Celtic culture, but they were also made and worn by the Greeks, Scythians, Thracians and other European peoples. The torc was a symbol of power and status, a visual indication of its wearer’s rank in society. 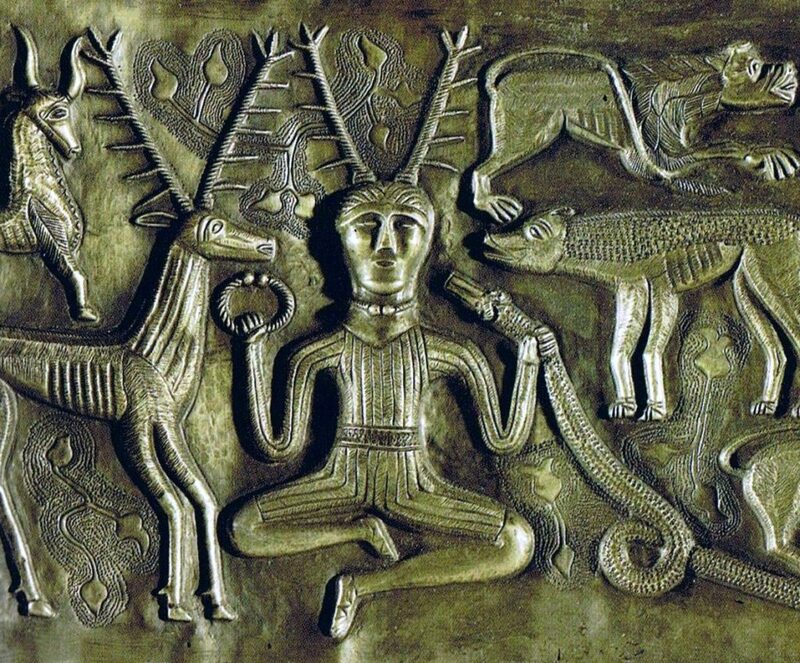 Torcs were worn by both men and women, and are depicted on men and women on both Celtic and Classical sculptures. And from what we understand, they are even more commonly found in Celtic women’s graves than they are in men’s graves. Torcs first appear in the Europe during the Bronze Age, starting around 1200 BC. They are typically simple round bars of gold or bronze, often very plain, but sometimes swelling at the ends to form unadorned terminals. Occasionally, instead of being round in cross section, they made with square or “X” shaped bars, or even flat ribbons, twisted to create simple patterns. It isn’t until the Iron Age that the torc blossoms into an art form unto itself. Starting in the 5th and 4th centuries BC we begin to see the simple forms from the bronze age evolve into much more complex designs. They are made from twists of numerous strands of wire, crafted from hollow tubes of gold, cast in solid silver, and hammered and twisted from bars of iron. They are adorned with geometric, organic and zoomorphic patterns. Animal heads and other elaborate designs are incorporated into their terminals. Indeed, torcs are some of the finest works of Celtic art! Torcs went out of fashion in Europe during the Migration Era. The last written reference to torcs being worn by the Celtic warriors was the British monk Gildas in the 6th century AD. However, during the Viking Era, neck and arm rings very similar in design to earlier torcs were made and worn by the North Men, and were in use well into the Middle Ages.